• 'Walking the Mystic Alleys', Amir Khusrau Website, 1998. • 'Aaj rachyo hai Basant Nijam ghar' (Today, the spring blossoms in Nizam's house), Qaumi Awaz (Urdu daily), Haftawar zameema (weekend supplement), New Delhi, February 15, 1998, pp. 1-4. • 'A Wedding with the Divine', Chowk.com, June 04, 1998 (a version of this appeared in the Times of India with the title "In Celebration of Death" in January 2000). • 'Can't we too break the wall? ', Chowk.com, June 23, 1998. • 'Musical Noise in Arab ki Sarai', a review of Muzaffar Ali's Jahan-e Khusrau, March 2001 (Amir Khusrau website). • 'A letter to Lanka Shri' (an anecdote), Sarai Readers List, July 2004. • 'A man for all faiths' (article about Gwalior's folk orator Dhole Bua Maharaj), Tehelka, New Delhi, 12 February, 2005, p. 30. • 'Popular Art Bridges Divide', in The Times of India, New Delhi, Feb. 18, 2006. • 'Breaking Boundaries: Devotional Iconography in Popular Muslim Posters in India', in Manushi magazine, No.157, Nov-Dec. 2006. pp. 12-15. • 'An Image Bazaar for the Devotee', in ISIM Review 17, Leiden, 2006, International Institute for the Study of Islam and Modernity, Leiden, The Netherlands. • 'Classical Music in Pakistan: The Impact of Partition', in Biblio, July-Aug. 2007, Delhi. • 'Media Circus of Terrorist Encounter at Batla House', Delhi (Sept 2007) Outlook India. • 'Mecca versus the Local Shrine: The Dilemma of Orientation in the Popular Religious Art of Indian Muslims', in Jyotindra Jain (ed.) India’s Popular Culture - Iconic Spaces and Fluid Images, a Marg book, 2007, Mumbai. See this article in Economic Times. • 'Remembering Amir Khusrau', Kashmir Monitor, Srinagar, July 13, 2008. • 'The Debate on Amir Khusrau’s "Inventions" in Hindustani Music', The Journal of Indian Musicological Society, Vol. 39, 2008, Mumbai. A different version of this on Aalam-e Khusrau. • 'An unequal music', The Friday Times, Lahore, Sept.26-Oct 2, 2008 (Report on 2-day workshop on Partition and Classical Music at Delhi). • 'Fled is that Music', in Ira Pande (ed. ): The Great Divide, India and Pakistan, (India International Centre Quarterly) HarperCollins, 2009, Delhi (238-249). • Khayalon ki sarhad nahin (Hindi), JASAM FILMOTSAV 2009 brochure, Lucknow: Jan Sanskriti Manch, September 2009, p 19-22, 26. • 'Muslim Exotica of Hindi Filmdom', a review on the book “Islamicate Cultures of Bombay Cinema” by Ira Bhaskar and Richard Allen, Tulika Books, Delhi, 2009, published in The Book Review, Aug-Sept.2009 (South Asia Special – XIV), New Delhi, pp 23-24. • 'Postcards from Lahore', Sarhad Mitra, July-Sept. 2010, Newsletter of Pakistan-India People’s Forum for Peace and Democracy, Pune. • 'Jugalbandi: Divided scores', Himal Southasian, February 2011, Kathmandu. • 'Let some fresh air in' (article about Jamia Millia's 'minority status'), The Hindustan Times, New Delhi, February 27, 2011. 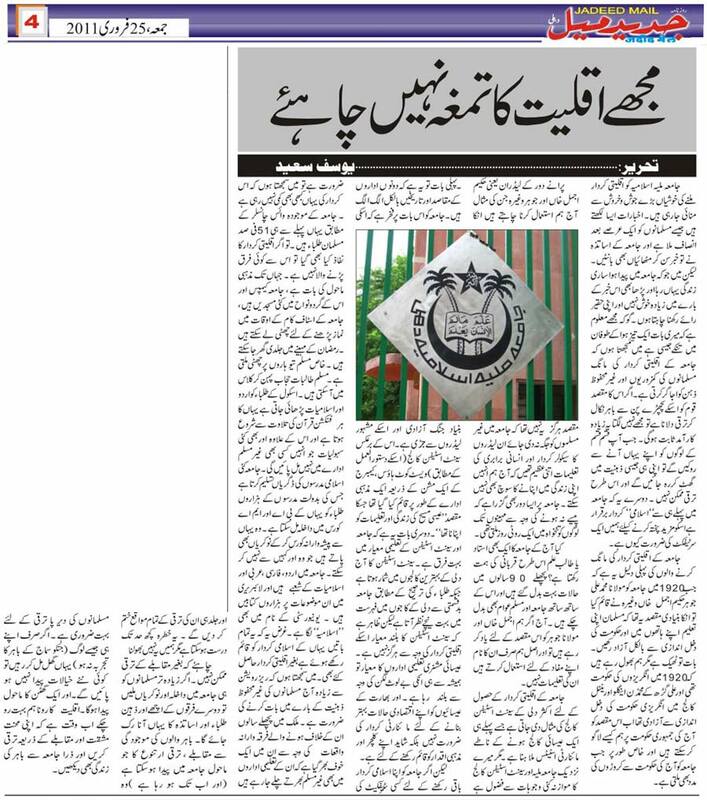 Also see its longer version, and its Urdu version published in Jadeed Mail. • 'Eid Mubarak: Cross-cultural Image Exchange in Muslim South Asia', Tasveer Ghar, March 2011, New Delhi. • 'Setting gender roles in Early Indian Print Advertisements', Marg Magazine (Issue titled 'Framing Women: Gender in Colonial Archive'), Vol. 62, No. 4, June 2011, Mumbai, pp. 84-91. • 'Nizamuddin Shrine’s Built Heritage and Delhi’s Urban Face-lift', Visual Pilgrim. Cluster of Excellence, Heidelberg University. • 'Windows of Pilgrimage: Announcement Posters of Religious Ceremonies', Visual Pilgrim. Cluster of Excellence, Heidelberg University. • 'Whose music is it anyway', Avantika magazine, Vol.1, issue 2, Feb.2012, Kolkata, pp. 88-90. • 'From Inclusive to Exclusive: Changing Ingredients of Muslim Identity in Bombay Cinema', in Robinson, Rowena (ed. ), Minority Studies in India, New Delhi: Oxford University Press, 2012. • 'How to start a riot out of Facebook', Kafila, August 13, 2012. • 'Jannat ki Rail: Images of Paradise in India’s Muslim Popular Culture', in Mumtaz Currim (ed. ), Jannat: Paradise In Islamic Art, Mumbai: Marg Foundation, 2012. A review in TimeOut Mumbai. • 'Depicting the Saintly Miraculous Powers in Islamic Poster Art of South Asia', in Gopa Gupta et al (eds. ), Religion and Popular Culture in the Indian Subcontinent (Seminar publication), Kolkata: Bethune College, 2012, 29-34. • 'Poster piety', Himal Southasian, Vol 26, No.1, January 2013, Kathmandu, p. 202-09. • 'Qawwali and Sufi Sama in Awadh', in M. Ali (ed. ), A Leaf Turns Yellow, the Sufis of Awadh, New Delhi: Bloomsbury India, 2013. • 'Writing an Art History of the Bazaar', Review of Glocal Studies, Vol.1, issue 1, Monsoon 2013, Saharanpur: Glocal University Press, 58-64. • 'Ishtihar Tasveeren: Visual Culture of Early Urdu Magazines', Art Connect, Bangalore: India Foundation for the Arts, 2014. • 'Eid ul Fitr: A Muslim Festival in India', introductory article on a module of Sahapedia archive. July 2014, New Delhi. • Visual Homes, Image Worlds: Essays from Tasveer Ghar, New Delhi: Yoda Press, 2015. (Designed and co-edited this book; also author of one of the essays). Purchase the book at amazon.in. • 'Visual Pastiche as a Symbol of Religious Pluralism in South Asian Muslim Popular Art', in Gerritsen, Roos and Stephen Inglis (eds. ), Street Art: Popular Expression in Urban India, Chennai: DakshinaChitra, 2016, pp. 26-35. • Hindustani mauseeqi ko Amir Khusrau ki dain: ek mu’amma (Urdu translation from original English by F.S. Ejaz), in Khusrau Darpan, a special volume of Insha Monthly, Kolkata: Insha Publications, February 2018, 201-06. • 'The Figural Image in Islamic Devotional Art of the Indian Subcontinent', in Gruber, Christiane (ed. ), The Image Debate: Figural representation in Islamic lands and across the world, Gingko Library, 2019, pp. 156-71. (forthcoming). • 'Qawwali', entry in Keywords for India: A Conceptual Lexicon for the 21st Century, edited by Rukmini Bhaya Nair and Peter Ronald deSouza, (forthcoming). • South Asia's Islamic Popular Art (a full-colour illustrated booklet featuring 40 religious posters), Singapore: Kitaab, 2019.